The Society of St. Vincent de Paul and Our Lady Queen of Martyrs are part of the Manasota District Council which included 12 Churches in Bradenton, Sarasota and Venice. Our Conference at OLQM has 10 members and 6 associated members, all volunteers. The main sources of our income are the poor boxes, quarterly envelope collections and an occasional “in Memory” donations. We also maintain a non-perishable food pantry for the applicants we work with. Bags of food are left in the office to be disbursed at the Society’s discretion. All of these are donated by our parishioners. We work by appointment Tuesday morning when applicants are interviewed. We assist with overdue bills for electricity, gas and water to keep them on. Bills are required to substantiate the charges. All checks are made out to the utility company and not the individuals. Cash is never disbursed. We help an individual once in a 12 month period and overall three times. We help those in need in our parish as well as non parishioners in our district based on available funds. Yearly financial reports and activities are submitted to Society of St. Vincent de Paul, National Council of the United States. Father Joseph F. Connoly, T.O.R. is our Council Spiritual Advisor. If you are interested in participating in the Ministry, please leave your name, address and telephone number at the church office. We will get in touch with you. 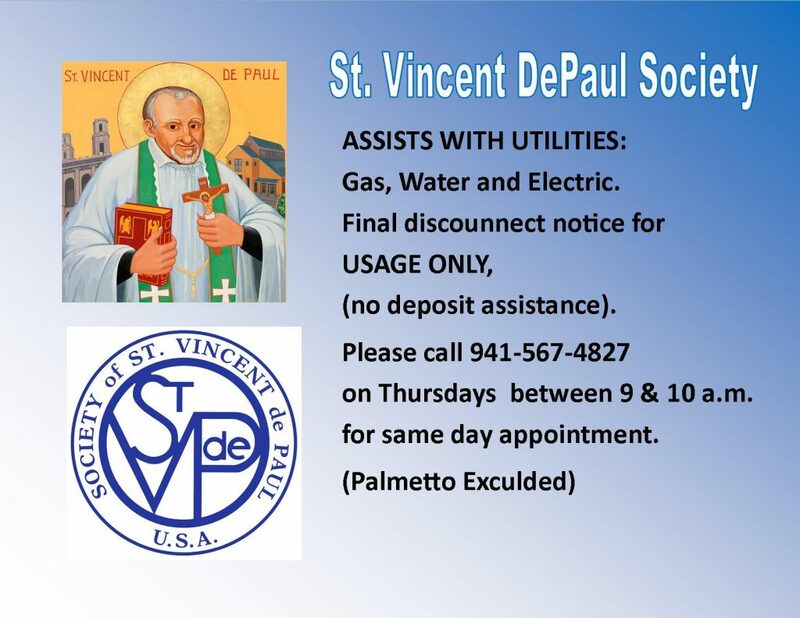 St. Vincent dePaul assist with Utilites: gas, water and electric. Final discounnect notice for USAGE ONLY (no deposit assistance). (Palmetto excluded). PLEASE CALL 941-567-4827 ON THURSDAYS 9-10 A.M. FOR SAME DAY APPOINTMENT.